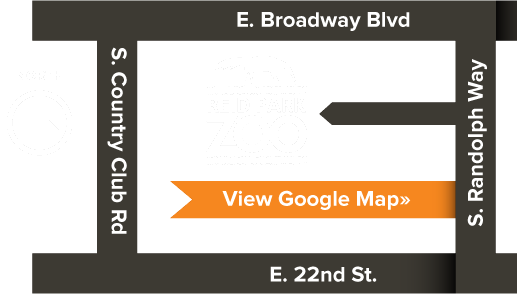 Thank you for your interest in Reid Park Zoo, the most visited educational and entertaining family attraction in Southern Arizona. The Zoo is honored to provide non-profit organizations with complimentary tickets to the Zoo for the purpose of fundraising activities. Every year, Reid Park Zoo receives numerous requests from for complimentary admission passes to the Zoo. Therefore, it is not always possible to honor every request. Given the Zoo’s limited resources, it is necessary to monitor the number of complimentary passes issued each year. The following guidelines have been established to help you determine if your organization may be eligible for a complimentary pass. If eligible, your organization will receive one pass valid for up to four (4) people to visit the Zoo. The pass is valid for one year from the date of issue. • Your organization must be a 501(c)3 nonprofit organization requesting complimentary admission passes for use toward your mission or for fundraising purposes to support your mission. • Your organization must be located in and serve the greater Tucson area (Pima County). • The request must be made at least one month prior to the fundraising event. • Only one donation request may be made per organization within the fiscal year (July 1-June 30). • Pass must be given away or used for fundraising at a LIVE event (no online auctions). • Groups or clubs raising funds with the intention of donating the proceeds. The request must come directly from the charitable organization. If you feel you meet these guidelines, please submit the Ticket Donation Request Form below. Zoo staff is unable to take phone calls regarding donated tickets. However, it is our intention that every request will be acknowledged with a response within 3 weeks. Do you have a Request Letter or Form?